We specializes in the preparation and packaging of tasty and nutritious Meals-Ready-To-Eat (MREs) for the military, for use in times of survival and crisis. We manufacture HALAL M.R.E. ration packs to your specification. Cooked / Uncooked rice Meat with / without gravy Rice and meat Pastes Pasta, noodle etc. Steak Other customizable combination's! Customize your own ration packs with us! Our military food specialists will provide nutritional specifications! HACCP and HALAL certified MRE available as well . We can produce any type of meals based on calories counts and specific tastes. From Asian, to Western ,Arab, and Spanish . SecPro Is committed to serving our clients with the utmost diligence – we provide cost-effective, reliable and quality products, and excellent service that meet and exceed our client's requirements and expectations. We aim to provide a 1-stop shop to your MRE needs including accessories like cooking stoves and flameless ration heaters. MRE meals are inspected and approved by the USDA for MRE meals are inspected and approved by the USDA for quality assurance and freshness before you buy. 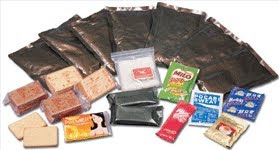 There are military MRE meals that can be stored for twenty years or more!